Must have been stars or Bewitched night! I recognized Paul Lynde but couldn't put a name to the familiar face on the left. Of course it's Jeannie! Thanks, Mark. Elizabeth Montgomery who played Samantha Stevens on Bewitched. Or are you funnin' us, John A? I always really liked Paul Lynde, and his characterizations. Yet, after seeing the picture above, it took me almost five hours to pull his name out of that dusty mess of an attic between my ears. Paule Lynde played the part of Uncle Arthur, Endora's brother, on Bewitched. And Allen Ludden, the host of Password, was the husband of actress Betty White. She has never re-married since his death many years ago. 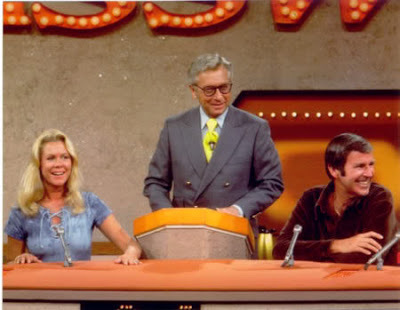 Ludden also hosted another game show on N.B.C. in the early 60's called College Bowl. It was sponsored by General Electric and pitted two teams of panelists from prominent Ivy-League universities in a timed question-and-answer format. It aired on Sundays in the early evenings (at least it did here on the West Coast). That's close, but it was on both CBS and NBC at different times. It began as a USO activity during the war, started on NBC radio in 1953, and began on CBS TV in 1959. Teams were from all over the country, not just Ivy League. I was a regular viewer. Sometimes I even knew a few of the answers. Paul Lynde also starred in Bye Bye Birdie, in which he played the role of Ann Margaret's father. I've only been around since January of '61, so I was going from a very early memory of mine which can sometimes be a little dangerous. Every other Sunday, we would visit my maternal grandparents in Bell, CA. We would usually arrive at their home in the late afternoon and I recall seeing that show on the tube every time we arrived there during the early 60's. My grandparents were avid viewers of N.B.C. So much so that the number 4 on the channel indicator on their R.C.A. color television eventually turned black from the heat of the pilot lamp behind it, while the others were virtually undamaged. I had no idea that show had been on that many years. Not only that,but Allen Ludden was the husband of Betty White ! They probably watched Channel 4 a lot because NBC was the color network. When color TV was being developed, RCA and CBS had competing systems. I never saw the CBS version of color TV, but I've read it produced a superior picture. The problem with it was that it depended on a mechanical spinning disk in the camera and a disk synchronized with it in the receiver. When the FCC was deciding which system to adopt nationally, they went with the RCA fully electronic version with no moving parts because it was compatible with existing black and white sets. For some time that was promoted in announcements on NBC. "The following program is brought to you in compatible color..." Walt Disney's anthology series, first called Disneyland, aired in black & white on ABC until Disney jumped to NBC in 1961 to take advantage of color. So for a few years NBC had the color shows, then ABC adopted color. I guess Bill Paley held a grudge, because it wasn't until the mid-sixties that CBS finally started airing color programming. That's why the early Andy Griffith shows are B&W and the later ones are in color. I got some education today. I thought that those shows who started with black and white were done that way until they were proved a winner. My dad was a late television pioneer. The NTSC was (if I recall correctly, I could look it up, but sometimes I like to live dangerously) the National Television Standards Committee (commission?). They were the ones that made the decision on which of several methods of transmission for color TV would be used in this country. As Steve says, the other front runner gave better results early on. It was actually adopted about 1950, but implementation was delayed due to the Korean war. During the delay, enough technical improvement was made to the first loser system that the NTSC revoked their previous approval, and changed to the system we later became familiar with, and became known as the NTSC color system. The reason for all this "back and forth" had to do with backwards compatibility. (A model T Ford connection!) From the beginning of television broadcasting, the television signal was designed around a six megahertz wide channel. This six megahertz wide channel was officially adopted in 1936 by a technical committee later to become known as the NTSC. The mechanical aspect of the system mentioned by Steve J required an additional frequency allocation. Various versions of this idea required from eight to twelve megahertz. For that, and other technical reasons, any program that was broadcast in color would not be viewable on a black and white television set unless it was double broadcast. Among the many problems that were foreseen by this were the cost to both broadcasters and the general public, most of whom already could not afford a television set yet. Another problem was the perception of a limited frequency spectrum available to television. The requirement of two to three times the frequency allocation PER CHANNEL was considered serious. Another interesting limitation considered at the time had to do with the mechanical aspect of the system. It had been mathematically estimated at the time that the size limitation of the screen would be about 19 inches. To some, that didn't seem so bad, considering that in the late 1940s when these debates were taking place, the average screen size in black and white was only slightly over six inches (although some B&W sets already were about 17"). The fact is, had they continued that way, an electronic solution probably would have later been found. But can you imagine NO big screen TVs? The NTSC adopted system we all became familiar with did turn out to be a good choice, in that it was fairly robust, acceptable to later changes and improvements, as well as backwards compatible with a single six megahertz wide channel being easily viewable on both B&W and color sets. Unfortunately, only a few years later, the PAL system was better developed, and adopted by most of the rest of the world. Most television engineers agree that the PAL system is superior overall. The lack of backward compatibility in it, however, resulted in the "Aunt Tillie" laws in England. State run broadcasters had to dual broadcast until everybody's last "great aunt Tillie" bought a new TV set. My dad used to tell of how eventually the state broke down and bought the sets for them because it was costing a small fortune to keep broadcasting the B&W signal to less than 50 known remaining "aunt Tillies". The things we got to read about in the trade journals. (I need to try to research some of that stuff on the internet. I wish I could just listen to my dad tell the stories again. An interesting personal side-note. My father was one of the first trained and qualified color television technicians in the San Francisco bay area. Even though we lived nearly fifty miles to the South in San Jose, he got emergency calls to run up to San Francisco to the television station to work on their color cameras, often in an effort to get the camera working before the planned broadcast time. (In those days, the daily setup time took a couple hours.) I got to go with him on several occasions and saw the live studios, blue rooms with NO corners, and other interesting things. This went on for a couple years, until the stations had enough of their own technicians and spare cameras to keep things going without outside help. An image I recall from those days, my dad, who was 6' 4", standing on a ladder servicing a television camera that to my young mind looked like an automobile (large) engine about five feet off the ground on top of a stand. How times have changed things. By the way, NTSC became jokingly known to engineers as "Never Twice the Same Color". That is just BAD! (But downright funny!) And you do know what brand of TV set I think of every time I see your name? Neat stuff Wayne--but then you usually have neat stuff to report! HEH HEH HEH--it's a joke son, I say a JOKE!! PS, Elizabeth Montgomery always seemed so upbeat--think she would have been a great neighbor!